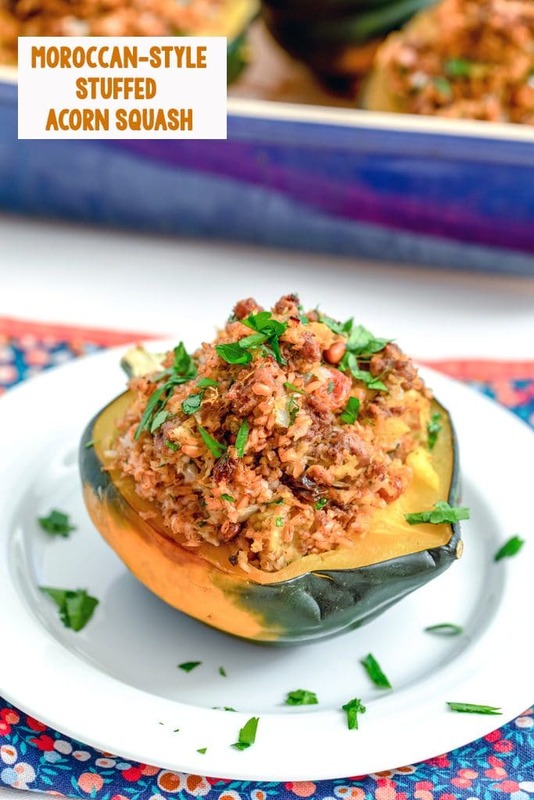 If you’re looking for the kind of comfort food that’s both hearty and healthy, this Moroccan-Style Stuffed Acorn Squash is the perfect cold weather dinner for you! (This recipe for Moroccan-Style Stuffed Acorn Squash was originally posted in October 2009, but was updated with new photos in 2019). One of my favorite things about fall and winter is squash. Maybe that seems like an odd thing to get excited about, but I also kind of love that the small things in life can make me happy. And the healthy things. But seriously, there are so many different types of squash and so many different ways to prepare it that you can legit have it every night of the week. One of my favorite ways to enjoy squash is stuffed. And one of my favorite squashes to stuff is acorn (though it may be a tie with spaghetti). As I was sitting in the airport a a few weeks ago, I was reading this month’s issue of Martha Stewart Living. 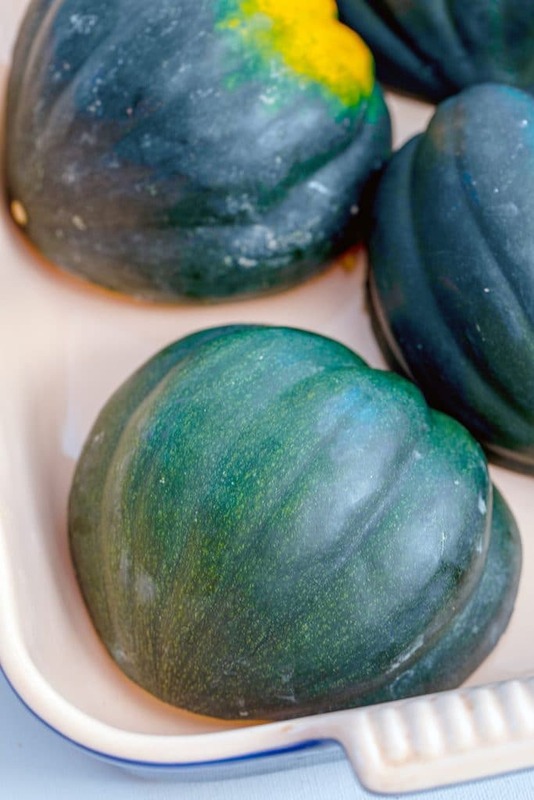 I came across a recipe for Moroccan-Style Stuffed Acorn Squash and the photo caught my attention, it looked like the perfect Fall dish. I’ve been dying to make it since I saw it in the magazine and last week I had the perfect opportunity. I did make some changes, but overall, it was a huge success! 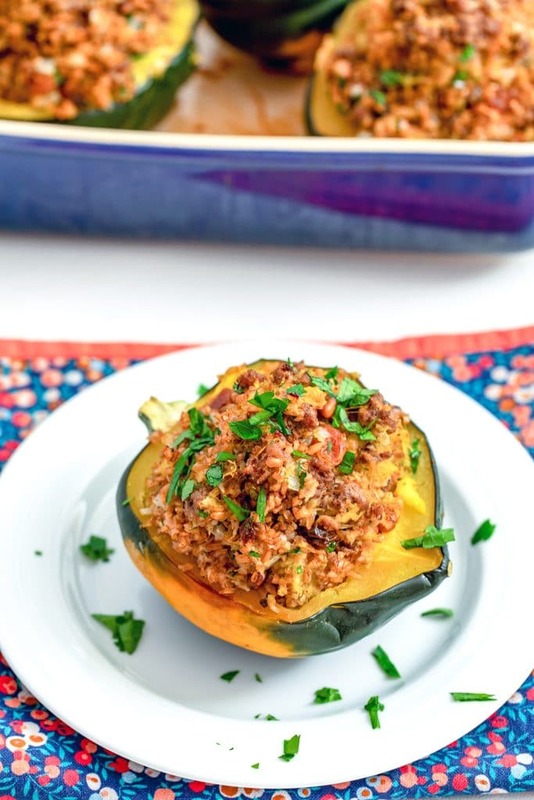 There’s so much to love about this Moroccan stuffed acorn squash, including the fact that the filling involves beef, bulgur, raisins, and pine nuts. And lots of garlic and spices! One of the main things I altered from Martha’s recipe to this one is the amount of spice used. She only had a “pinch” of cinnamon and a “pinch” of nutmeg and I felt like that made for a pretty bland dish. So, I added more than a pinch of cinnamon and nutmeg and also sprinkled in some cumin and paprika. Much better! I also upped the amount of raisins a bit because I love a little bit of sweet in my savory dishes! To start, slice the acorn squashed in half and scoop out the seeds. Place them face-down in a baking dish and bake at 400 degree for 35-40 minutes, until they’re tender. While the squash is in the oven, you can get started on the filling. First you’ll want to cook the beef and spices (make sure you use a pot or dutch oven with a tight-fitting lid). Once the beef is browned, transfer it to a bowl with a slotted spoon, leaving behind as much oil as you can. Add the onion to the same pot and cook until somewhat translucent (about 5 minutes). Add garlic and cook for about 30 seconds, until fragrant. Add in a little more salt and stir in the bulgur. Add water and bring the mixture to a boil. Reduce heat to medium-low, cover and cook for 15 minutes. Remove from heat and let stand for about 5 minutes, covered. You’ll start to see everything coming together, and the bulgur will start to absorb the liquids. 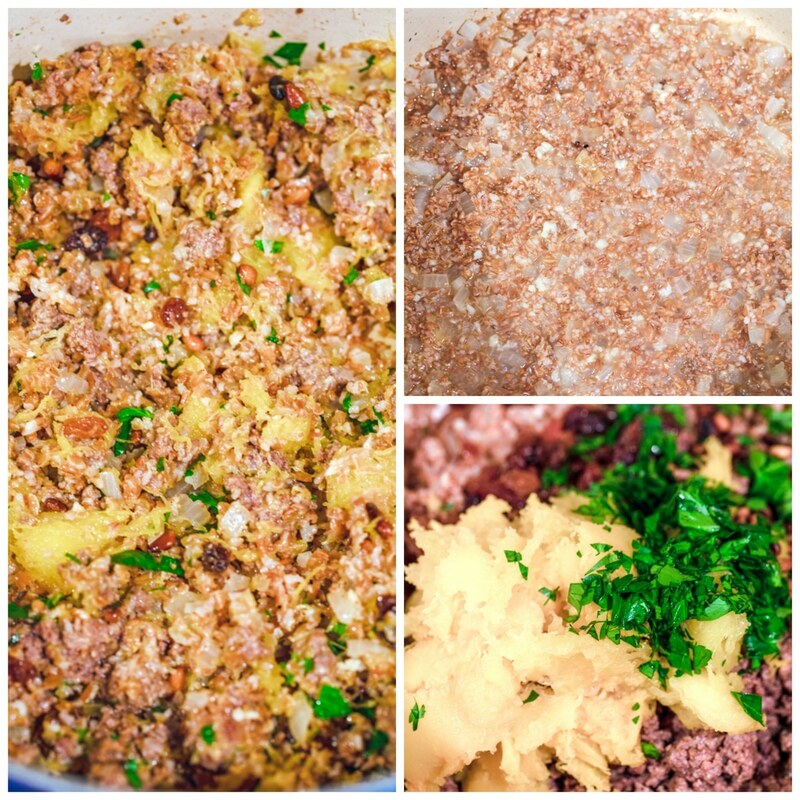 Fluff the mixture with a fork and add the beef mixture, the raisins, and pine nuts. When you squash comes out of the oven, scrape out the flesh, leaving a little border. Fold the squash flesh into the bulgur mixture. And then stuff the squashes with the mixture. Bake for about 12-14 minutes, until everything is warmed through and the tops of are browned. This Moroccan stuffed acorn squash is one of those dishes that looks all fancy and complicated, but is actually quite easy. I love the idea of serving it to company with a nice fall salad on the side. 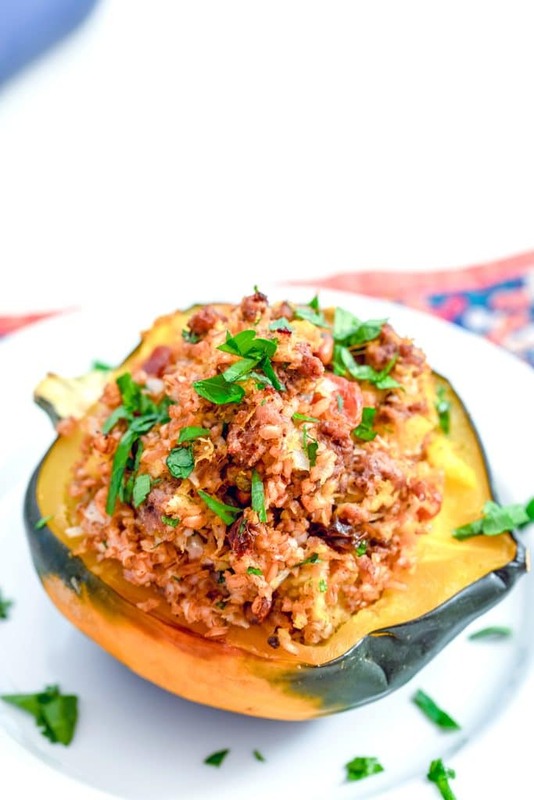 Some of us may have some people in our lives who don’t love squash (ahem), but I feel like it’s really hard to argue with a delicious squash dish like this one since it includes beef and hearty bulgur. It’s a meal that really fills you up and satisfies. Plus, I just love scraping out the rest of the squash flesh when I’m done eating the filling. I’m really happy I altered the original recipe and added additional spices; they were much needed and appreciated. I feel like Moroccan food should have a nice flavorful kick to it, right? I also absolutely loved the addition of the golden raisins. They added such a fun sweet touch amongst the meat and spices. 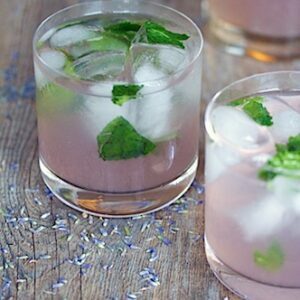 The parsley on top adds some nice freshness, too. 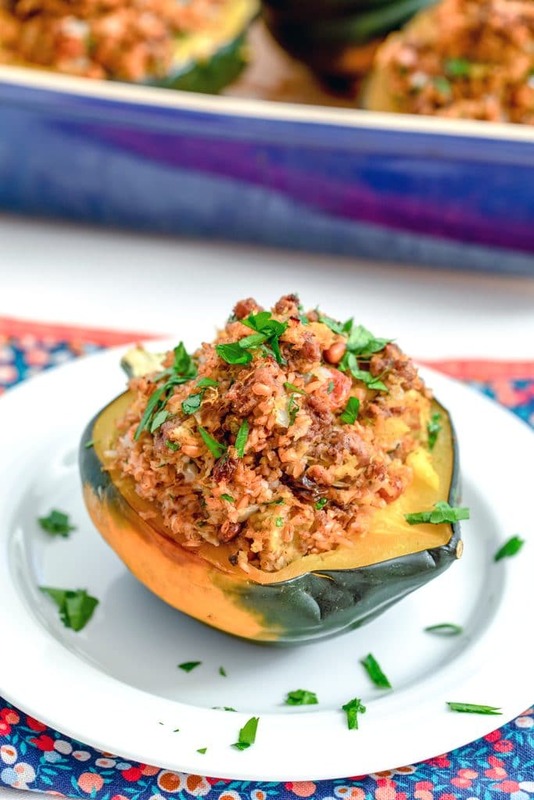 Oh, and we can’t forget the fact that Moroccan stuffed acorn squash is actually pretty healthy, while still feeling a bit like comfort food on these chilly evenings. 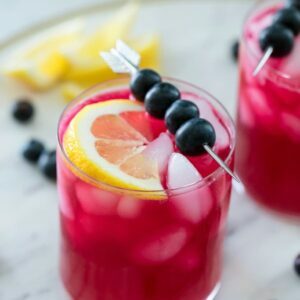 What’s your favorite kind of squash? If you love stuffed squash, be sure to check out my Sweet Wild Rice Stuffed Squash and my Quinoa Stuffed Acorn Squash. I’m also loving these Spaghetti Squash Burrito Bowls from Toaster Oven Love. 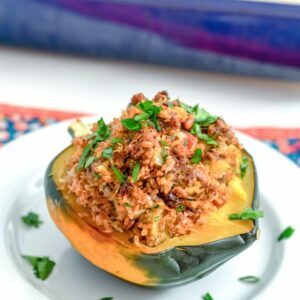 If you're looking for the kind of comfort food that's both hearty and healthy, this Moroccan-Style Stuffed Acorn Squash is the perfect cold weather dinner for you! Preheat oven to 400 degrees and place squashes cut side dow in a 9×13 inch baking dish. Bake until tender, 35 to 40 minutes. Heat oil over medium-high heat in a dutch oven or pot (make sure it has a tight-fitting lid) and add ground beef, cumin, cinnamon, nutmeg, paprika, pepper, and 1 tsp salt. Cook, while stirring frequently, until beef is brown and cooked through roughly 5-7 minutes. Using a slotted spoon, transfer the beef to a bowl, making sure to keep as much cooking oil in the pot as you can. In the same pot, add onion and cook until somewhat translucent (about 5 minutes). Add garlic and cook for about 30 seconds, until fragrant. Add remaining tsp of salt and stir in the bulgur. Add water and bring to a boil. Reduce heat to medium-low, cover pot and cook for 15 minutes. Remove from heat and let stand for about 5 minutes, covered. The bulgur will start to absorb the liquids. Fluff the mixture with a fork and add the beef mixture, the raisins, and pine nuts. Scrape out the flesh of the baked squashes to form bowl (leaving about 1/4-inch border) and fold the flesh into the bulgur mixture. Stuff the squash with the bulgur mixture and bake until warmed through and the tops are nice and browned, about 12-14 minutes. 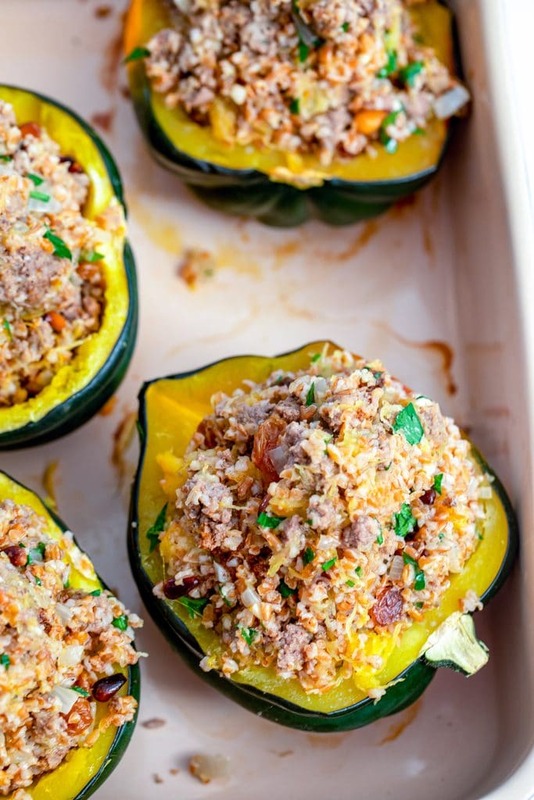 8 Responses to "Moroccan-Style Stuffed Acorn Squash"
Y’all, this looks a-mazing. The combination of meat with dried fruit is seriously underrated in this country. Casablanca ftw. 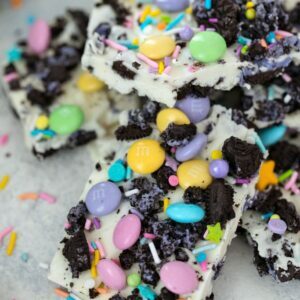 Mmmm, these look fabulous! 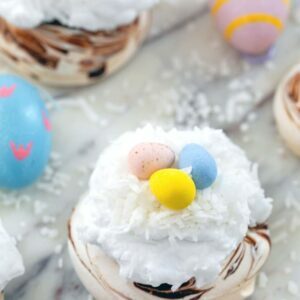 I love trying new ingredients too, which I’ve definitely done more of ever since I started my blog! I have a good tip for slicing fresh squash! I generally warm my squash in the microwave for 2-5 minutes. I find it much, much easier to cut. Stewart’s magazine, thank you, can’t wait to try it.